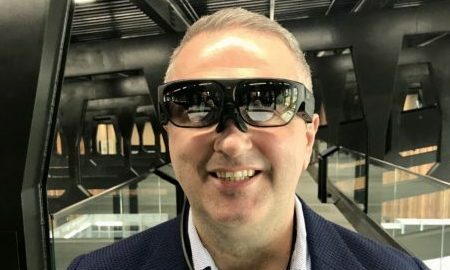 Tradiebot founder, Mario Dimovski, tries out the latest in smart glasses during his visit to Trumpf Smart Factory in the US. platforms being developed by Tradiebot Industries for vehicle collision repair. The automotive repair industry, like many other sectors, is struggling with a shortage of skilled workforce, both in Australia and globally. The Department of Jobs and Small Business’s employment projections to 2022 show that for the vehicle spray painting alone, as many as 3,243 vacancies will be created in the coming years. Meanwhile, PwC’s Industry Forecast in May 2017 reported that workforce shortages in the vehicle body repair and refinishing sectors are likely to persist over the medium to long- term. The skills shortage is not limited to Australia. IBIS Global Report 2018 shows that around the world, there is a growing shortage of qualified technicians in the auto body repair industry. Mario Dimovski, an automotive-based business owner with more than 25 years’ experience in the auto repair sector, decided to seek the answer in robotics and digital tools. Thus was born Tradiebot Industries, or Tradiebot for short. Dimovski founded Tradiebot in 2017 to develop solutions that can transform the automotive repair industry with the help of new technologies, such as robotics, Artificial Intelligence, 3D printing, augmented reality (AR) and virtual reality (VR). “We are not really re-inventing anything. We are simply fast following what other industries are doing,” Dimovski told Manufacturers’ Monthly. Dimovski sees automation not as a means to replace human with robots, but as a way to address the current shortage of workers in his sector, as well as a way to attract millennials. “We are creating multiple layers of value with Tradiebot: we are filling a void in our industry, we are helping solve the problems faced in the sector, and we are up-skilling the current industry, which hopefully then will make it more attractive for the younger generation by creating new digital career opportunities and skills. “By automating the panel-repair process, we shorten the repair process and the time required to train people to carry out the tasks. This also helps to attract the young generation to the sector, because they will now have the opportunity to work with robots and manage automated systems, rather than doing so much hands-on tasks, which is so much more attractive as a career choice,” Dimovski said. 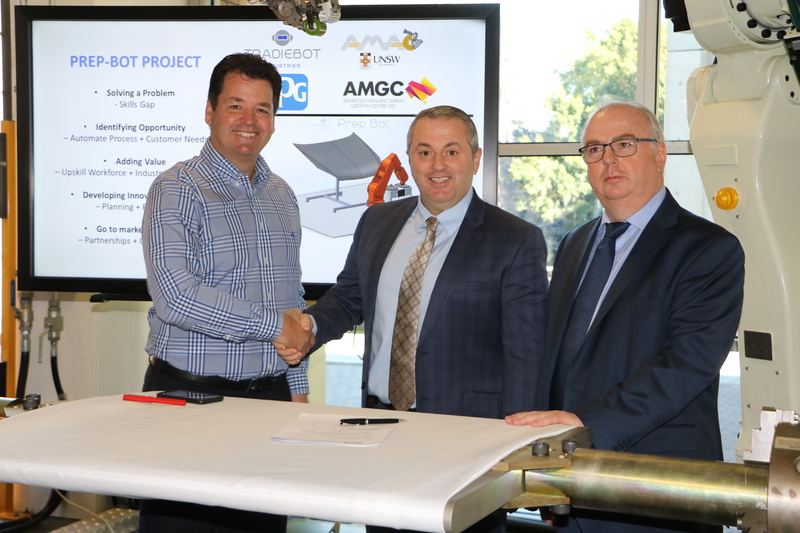 AMGC state director Michael Sharpe (left), Tradiebot chief creator Mario Dimovski (centre) and PPG Industries Australia marketing director Kevin Woolerton (right) at the project signing ceremony in UNSW-Sydney. Dimovski believes that collaboration is the strongest aspect of Tradie- bot. He is currently working on a number of parallel projects with universities and partner industries, including PPG Industries, AMA/ Gemini Group and Capital SMART, to better develop smart solutions for automotive repair. Tradiebot is also planning to work closely with original equipment manufacturers (OEMs) to establish a digital catalogue comprising of computer-aided design (CAD) files for vehicle panels and parts, to guide the company’s automated repair systems or for additive manufacturing purposes – such as on-demand 3D printing of auto parts. Dimovski says a big challenge for him is to change the mind-set of some OEMs to convince them about the industry’s shift towards digitalisation and the collaborative opportunities that will ultimately benefit the repair shops. “Our research shows that the repair processes on the shop floor can be reduced by up to 50 per cent through the use of digital tools and providing the technician with up- to-date repair criteria. The digital parts’ database will also create new revenue streams as the digital files can be sold via certified OEM partners,” he said. A collaborative project between Tradiebot and Swinburne University – called Repair Bot – looks into using 3D printing technologies and robotics along with novel plastic materials to enable an automated rapid repair service for plastic car parts. The project is co-funded by the Innovative Manufacturing Cooperative Research Centre (IMCRC) and Tradiebot has partnered with leading automotive collision repairer AMA/Gemini Group to collaborate and validate the processes. “Working with leading names in the repair industry, including PPG Capital SMART and AMA/Gemini Group helps us understand the current needs and to develop our solutions around the real problems that the industry is facing,” Dimovski said. Another project, co-funded by Tradiebot and the Advanced Manufacturing Growth Centre (AMGC) and supported by the University of New South Wales’ ARC Training Centre for Automated Manufacture of Advanced Composites (AMAC), focuses on digitalising the process of repairing damaged vehicle panels. The project – called Prep Bot – is focused on developing an integrated solution that uses sensors, 3D scanners and image processing tools to develop virtual models of vehicle panels. These help assess the extent of the damage and then uses a robot control system that can conduct physical repairs, including sanding, painting and polishing. Apart from providing an internal solution for the automotive repair sector, Dimovski believes the project could also lead to creating new manufacturing jobs in Australia as the technology sets to disrupt the global automotive industry. Upon successful validation of the project, Tradiebot plans to export the technology through PPG as its global value chain partner. “We are currently developing the algorithms and the cloud-based systems using artificial intelligence and various other data. Those will be driven by hardware, which includes the scanners and robots and systems that we need to put together. So there’ll be a large proportion of manufacturing involved on our projects, be it assembling existing parts, or manufacturing them from scratch,” he said. The Tradiebot Industries’ team exhibited the company’s virtual/augmented reality training and services solutions at the Skills Show Australia 2018. Dimovski’s message to business owners and the industry is to embrace the digital transformation and not be afraid of it. “We have all of the tools available to transform the auto repair industry. We have some of the most talented skills in our universities and these technologies are already being applied in other sectors,” he said. Tradiebot is in the process of developing an Industry 4.0 course, in collaboration with one of the leading Australian universities. Dimovski said the company intends to prepare people involved in the auto repair sector to embrace the new technologies and attract a new generation of digital technicians. “The aim of the course is to educate the whole industry, from the technicians working on the shop floor to the business owners, to understand what’s available and what each technology does. Because they are the ones that will ultimately be using it and they can hopefully give us feedback to either develop more solutions or tweak the existing ones,” he said. 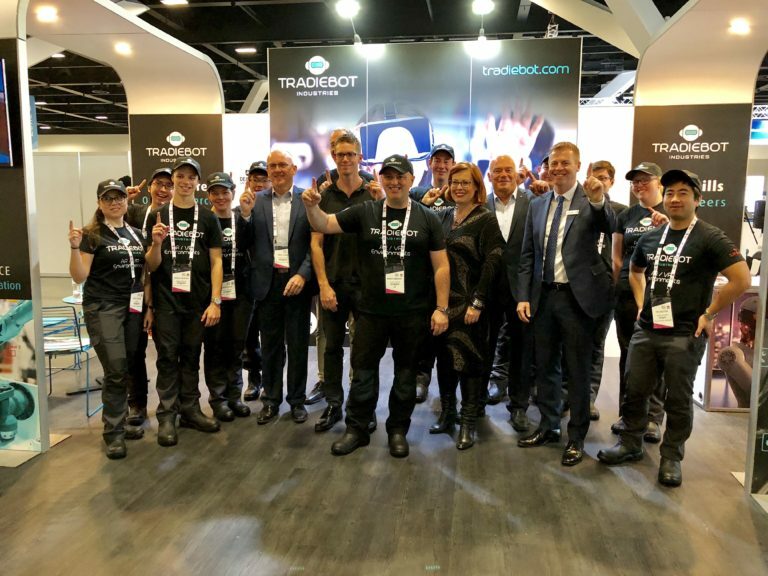 To attract the new generation to the auto repair industry, Tradiebot is also involved in a collaborative research project with Deakin University that explores the use of virtual and augmented reality technologies to develop a new Industry 4.0 training and digital planning system for the automotive collision repair and service industry. A version of the VR simulator, which trains the users in auto body painting, has already received great interest from schools and educators. Dimovski said Tradiebot plans to offer the simulation software as a downloadable version, so the schools can use it for their students that he hopes will create interest in the profession. Dimovski is a strong believer in keeping his business open to new ideas and collaboration opportunities. “At Tradiebot, our strongest aspect is that we collaborate. We share and we are open. Many people ask us: why do you disclose so much? But that’s our motto. We have no problem saying this is what we are doing, because by sharing it, we also invite people to come forward and make new propositions. “So far, it has worked to our favour. We are getting a lot of interest from all over the world and have some of the industry-leading companies as close collaborators and partners that we aim to work closely and transform the collision industry as we know it in the near future. “Another exciting part about being transparent about our developments is the amount of interest we are receiving from other industries outside automotive,” Dimovski said. Defence is one industry where Dimovski has already started the talks. “Defence is a sector we have been moving towards and exploring in recent times as we align our solutions with their needs. We have identified many similarities in what our solutions offer around automotive that fit the defence industry needs. its services and technologies, with the assistance of AMGC, helping connect companies together,” he added.